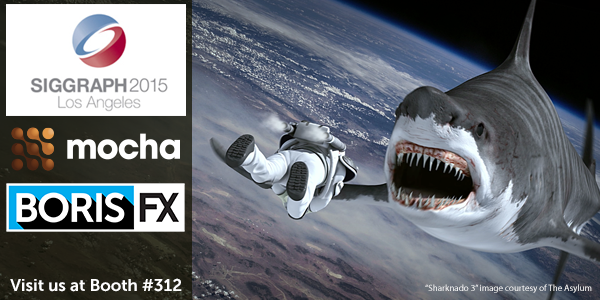 Los Angeles, California – August 6, 2015 – Boris FX™, the leading developer in VFX and workflow solutions for film and video, and Imagineer Systems, the Academy Award-winning developer of Mocha® Planar Tracking tools, will showcase the newest versions of flagship products Boris Continuum Complete (BCC) and Mocha Pro at SIGGRAPH on August 11-13, 2015 at the Los Angeles Convention Center in booth 312. The upcoming BCC 10 release offers integrated Mocha tracking and masking technology, new 3D titling and animation tools, import of Maxon Cinema 4D models, new image restoration filters, new transitions, and added host support. Mocha is the award-winning planar tracking and roto-masking software developed by Imagineer Systems. The upcoming Mocha Pro 5 release will add a new effects panel for integrated keying, grain, sharpening, and skin smoothing; new Python scripting support, and the ability to launch Mocha Pro as a plug-in from host applications such as Avid Media Composer, Adobe After Effects, and more. Visit Boris FX / Imagineer Systems at SIGGRAPH and register to win software prizes in the daily giveaway. August 11-13, Los Angeles Convention Center, Booth 312.